Delta Phi Lambda Sorority, Inc. The sisters of Madison Delta Phi Lambda Sorority, Inc. would like to proudly introduce our newest butterflies! 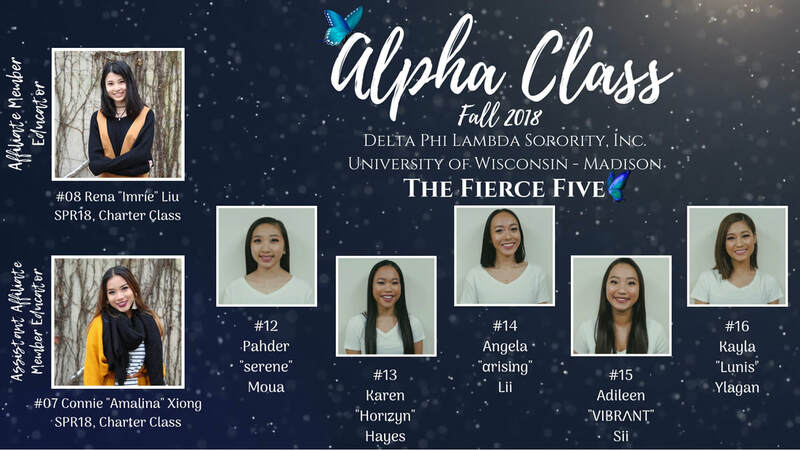 The Fall 2018 ALPHA CLASS, The Fierce Five! We would like to thank our AME team for guiding these new butterflies to Everlasting Sisterhood®. In addition, we would like to thank our sisters for their constant support! Delta Phi Lambda Sorority, Inc. is a 501(c)(7) non-profit organization that advocates Asian awareness and empowers womxn to lead through values-based programs and everlasting sisterhood. Delta Phi Lambda’s national philanthropy is osteoporosis education and prevention, emphasizing the importance of promoting healthy lifestyles and behavior in young womxn. Founded in 1998, Delta Phi Lambda Sorority, Inc. has grown to 20 undergraduate chapters in 12 states spanning the Southeast, Northeast, and the Midwest.